This recipe seemed particularly appropriate to share as many readers are Christmas menu planning and prepping. It was a hit at our Thanksgiving table, and I’m pleased to report that (courtesy of prepared crust) it was easy as well as delicious. That’s about all I require in a baked good – because I am not a baker. Apple pie is a classic holiday dessert, and by far my favorite treat year-round. At some point in my childhood (my mom likely remembers exactly when), I fell in love with apple pie and began requesting it for every special occasion. No cake for me, thanks – I’ll have my birthday candles on a pie, and so on. Over the years, I’ve developed into a bit of a pie snob, which has led me to the unfortunate conclusion that if I like my apple pie just so, I need to make it myself – or spend a fortune at carefully-vetted local bake shops. 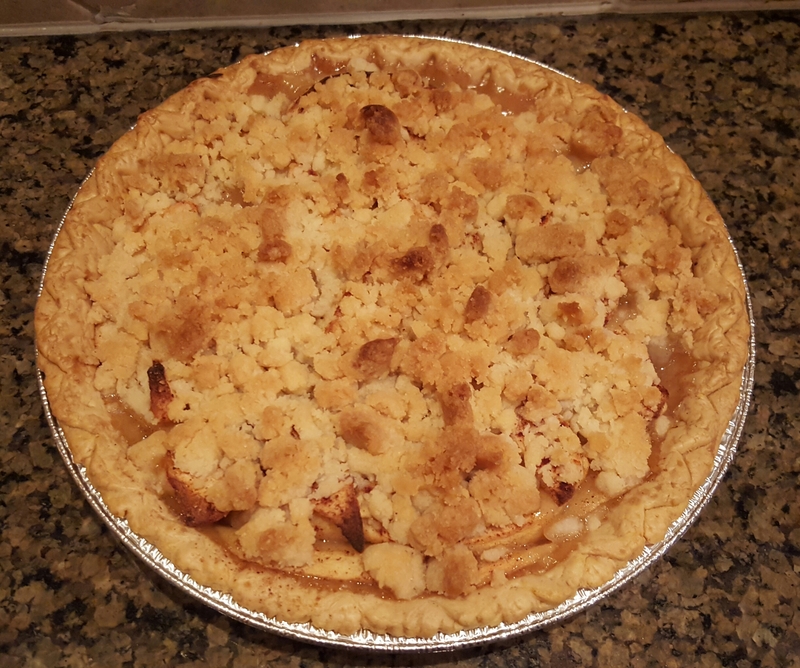 This decided, I bravely forged ahead and have attempted apple pie from scratch on more than one occasion, but after two minimally successful and one absolutely disastrous experience with homemade crust, I made a key concession: purchasing prepared crust. If I loved to bake, I might find some strange pleasure in the painstaking blending of flour and (ice) cold water and the subsequent torturous rolling out of crust (and then the true frustration: attempting to peel your now beautifully flat, round crust off the countertop, only to discover that it’s basically bonded in place except for the edges, which will gleefully separate and crumble into to useless bits – not that I’m speaking from personal experience…), but see, this is just not my cup of tea. Whiskey, on the other hand, might get me through it. And to be completely honest, my pie snobbery does not extend to the crust. Once baked, I can’t tell the difference between a nice, prepared crust and one made from scratch – and frankly, if I could, I think Pillsbury would be in the lead. Not to mention, everyone around me is much happier as a result of this small adjustment (i.e. Nick). So prepared crust it is. I remember reading this recipe for the first time and exclaiming, “look – it actually CALLS for prepared crust!” A dream apple pie recipe if ever there was one. It comes from Recipes from the Maine Kitchen and is the perfect combination of a pie and a crisp – with a crisp’s crumbly, sugary topping. Preheat oven to 350 degrees. In a bowl, mix the flour and sugar and blend in the softened butter, then set aside. Place the apples in the prepared pie crust, and grate nutmeg and cinnamon over top (for the record, I pre-tossed my apples with nutmeg, cinnamon, and the dash of salt so the flavors would be throughout the pie). I also added just a bit of almond milk, but any cream would do, if you like a slightly creamer finish. Cover with the flour and sugar mixture – for the crisp top – and bake for 40 to 45 minutes, until a knife goes easily into the fruit when tested. Serve warm with vanilla ice cream. Don’t judge my pie or my photography… I’m not Martha Stewart. Just know that this pie not only lived up to, but exceeded my (lofty) expectations. Categories: Eat, Holidays, HoME Grown | Tags: apple pie, apple pie recipe, baking, Maine | Permalink.